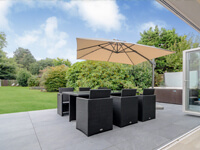 Greensquares provide a comprehensive range of outdoor living products and services. 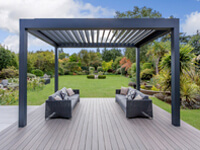 If you’d like to turn your tired old garden into a luxurious outdoor living space, we’ve got everything you will need right here. Greensquares was founded by Jason Cole, who remains the company’s Managing Director today. 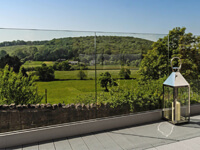 With headquarters in South Wales, Greensquares quickly became established as a leading supplier of high-quality composite decking (a product that, at the time, was relatively new to the UK market). Move to larger premises, recruitment of more personnel and large growth of the TimberTech business. Further expansion sees the company outgrown its base in Penarth. A move to the current Head Office in Cardiff follows this year. 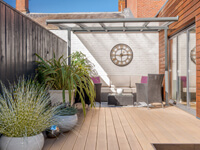 Having achieved enormous success as the UK’s official supplier of TimberTech composite decking, Greensquares added a new string to its bow: PrimaPorcelain tiles and paving. Suitable for both indoor and outdoor use, PrimaPorcelain’s stellar range set a new standard for porcelain flooring products in the UK. By this time, Greensquares wanted to get closer to its customers in the South East. So Jason and the team decided that it was time to expand. 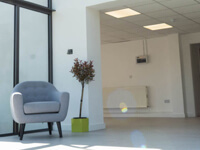 In 2014, Greensquares opened a new showroom in Slough, making it easier for customers in the South East England to pay us a visit and take a closer look at our fabulous products. This was the year Greensquares added SunSpaces verandas & garden rooms to our portfolio. During 2017, a third outdoor living showroom in St Albans was opened, just a little way north of the M25. By this point, we had made a national name for ourselves as the company who could transform your garden without adding a lot of tedious, time-consuming maintenance to your already busy life. 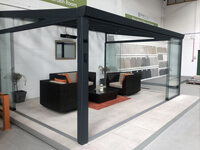 At Greensquares, we strive to provide a complete outdoor living service to our customers across the UK. 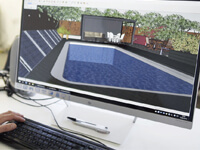 Our in-house design specialists can provide detailed 3D designs of your new outdoor space before work has even begun. This will help you to visualise your new space and make sure it’s exactly what you had in mind. Not big on DIY? 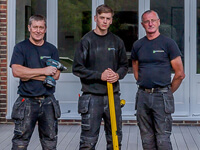 Don’t worry – we employ a team of professional installers who are experts in installing our products. The Greensquares installation team will ensure that your project is completed to perfection. If you want to compare our products to other manufacturers’ offerings – or if you simply need a closer look to help you make up your mind – we are happy to send decking and paving samples to your address free of charge. We frequently carry out home visits and site surveys in order to take measurements and familiarise ourselves with the space that we’re going to be revamping. Visiting your property also helps us to make suggestions and recommendations. Greensquares Network is our nationwide network of professional installers. We only select the very best experts to represent Greensquares, so you can rest assured that your project will be handled with the utmost care and professionalism. We don’t just work in people’s back gardens! The Greensquares team have handled countless commercial projects over the years, and our portfolio ranges from office blocks to boutique hotels. No job is too big or too unusual. If you are ready to revamp and get more leisure time, Greensquares would absolutely love to hear from you.